Ensign Best : Journal - Norfolk Island & New Zealand, 1838-1843. 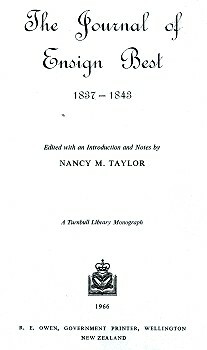 Edited with an Introduction and Notes By Nancy M. Taylor. Best's journal is of interest for several reasons, primarily the transport from ship to shore through the surf zone in a long boat. On his arrival, the boat "rapidly passed on the crest of a wave in Island term we had a run & then found ourselves on the beach" (page 182). Island term cleary indicates the British mariners have adopted wave riding techniques as practised by Polynesian islanders and, in surfboat parlance, a run is "a shoot". boat being slew'd completely round and the sea breaking over the boat I was drenched to the skin. he got more than he bargained for." - page 187. The activity was both exciting and liable to disaster. On the 5th March 1839 the long boat (the Fairlie) is capsised returning to the beach and, although there are few injuries, "all Guns &c went to the bottom" and the Fairlie "is not worth repairing there is scarce a whole plank in her." - page 201. Also note that sea bathing is a regular, if not daily, activity for Best, "Bathed at eight there was a good deal of swell in the Bay" (page 186), and the presence of "the bathing house" (page 201) suggests that this was a common practice for the other officers. Wereas Norfolk Island was used to disipline recalcitrant convicts from the penal settlement of Sydney and had a reputation for extreme cruelty, Best appears to have found his posting highly enjoyable. In 1854 the penal settlement on Norfolk Island was abandoned and its convicts moved to Port Arthur in Van Dieman's Land (Tasmania), a location of equal infamy for its cruelty towards the inmates. In 1856 it became the new the home to some of the Bounty descendants, who were relocated there in from Pitcairn Island. These descendants where the progeny of European sailors and Tahitian women who on Pitcairn retained surfboard riding as part of their Polynesian heritage and brought their skills to Norfolk Island. Frederick B. Schell (1838 - 1900): Landing Through the Surf, Norfolk Island (1886). An American artist, Schell was active in Australia from 1886-1889. He was brought out to produce views for the Picturesque Atlas of Australasia, a comprehensive survey of Australia's colonial history published to mark 100 years of Australia’s settlement. Conceived and financed by American publishers under the name of the Picturesque Atlas Publishing Co Limited, Sydney and Melbourne, it used the best artists, the best paper, the finest printing engraving techniques, and was a financial failure. During his posting to New Zealand, Best experiences several instances of the Maoris efficient surf skills, although wave riding is only suggested, see page 263. 1847 George Angas : New Zealand Canoes. In the morning early awakened by the cry of "Land O!" Went on deck and could just distinguish something like a cloud right ahead which the mate said was Phillip Island. By eight oclock we saw it distinctly but we were not off the settlement at Norfolk Island untill past one. The approach to this Island from the sea is very striking the Peak of Phillip Island rising abruptly from the sea to the height of at least 1000 feet admirably contrasts its naked grandeur with the cliffs of Norfolk Island clothed with perpetual verdure to the waters Edge. The Settlement is situated on the only low piece of ground which appears from the Sea and with its white buildings has a very pleasing effect while innumerable lovely vallies run towards the hills in every direction. Norfolk Island as I viewed it from the deck of the Brig was the Loveliest spot I had ever seen. The boat which we had seen putting off soon came alongside it contained an Officer, Non. Com. a Guard of two Privates, the Coxwain & crew of seven prisoners. The Officer boarded the brig enquired for the Mail & at the same time informed us that the Commandant sent permission for any Officer to land except the commander of the Guard. Lugard & myself had made up our minds not to go on shore that night so we declined taking advantage of the Majors Kindness. Shortly after the boat reached the shore it again put off the Coxwain bearing a special invitation from the Officers of the Mess to Lugard & myself to come on shore; this we could not refuse. I went to my cabin put on my uniform & got into the boat. Half an hours pulling brought us to the Bar (a reef running in front of the Settlement with a passage in it, large enough to admit a boat in fair weather) this we rapidly passed on the crest of a wave in Island term we had a run & then found ourselves on the beach where the Officers all of whom I was acquainted with were waiting to recieve us. The sun was now down we adjourned to the Mess room (with the exception of Lugard who had gone to Government house) and there spent a very pleasant evening. Got up at half past seven went to bathe. Church in a barrack room at ten. In the afternoon went out for a walk returned to dinner. Mr & Mrs McDonald came ashore during divine service & took up their quarters at Government house. Arose at seven bathed & breakfasted. The wind had changed the brig was obliged therefore to go round to the opposite side of the Island and layoff Cascade bay. All the Detachment except six & a Non Com. landed bringing with them my four dogs. Nettle I immediately chained up the bull pup staid with her the two others followed me to my room - or rather to the room of the officer with whom I put up I was very busy all day, doing nothing in the forenoon and after luncheon walking to the Government farm at Long Ridge to shoot Pigeons. There was a small party at mess we did not disperse till late. Took my swim at the usual hour. The brig was still at Cascade so we made a party to walk out & see her. A beautiful walk it was through groves of Lime & Lemon trees in full fruit interspersed with Guava shrubs the distance was about three miles. Having satisfied ourselves that the brig was all right we returned home. Lugard, Needham (61) & I dined with Major Anderson. (Footnote) 61. Needham an Ensign & who I believe was at Sandhurst with me. Bathed at eight there was a good deal of swell in the Bay. ... make a party for fishing and Phillip Island. Lugard, Knowles, Hill and myself were those who went leaving Capt Gtinton and McDonald to take care of the Island. It was a calm day but no fish were to be caught we therefore pulled on for Phillip and landed, the Major remaining in the boat & returning to the fishing ground. We shot about ten couple of rabbits & saw plenty of tracks of Pigs and Goats but not the substance & returned to dinner, eat very heartily, got into the boat to return. Since the morning a good deal of sea had got up & crossing the Bar we got a tremendous run the boat being slew'd completely round and the sea breaking over the boat I was drenched to the skin. Coming over I had expressed my wish of having a good run, the Major hoped we should have no such thing (I wanted to see what a run was like) and the opinion of all was that the coxwain who is a daring seaman waited for a heavy sea in order to give me a specimen of what a good run was; if so he got more than he bargained for. In the Evening we sat up untilllate talking over our excursion. Was down at the bathing house by eight spent the day in my garden & stockyard & writing to Orme. At 9 after returning from bathing Lugard, Tyssen & Mr Turner the new Commissary embarked in the Fairlie for Phillip Island. I spent the day much as the last & was dining with Arnold about five when the servant came running in to say that the boat had had a run & capsized I hastened to the beach and there sure enough was the boat upset & all the people scrambling out of the water the Coxwain & a Soldier were the only people hurt & they not seriously. No blame could be attached to the former who laid off untill several seas had passed but unfortunately just as he ran in on the supposed last another came as he was endeavouring to turn the comer caught her under the counter and over she went. The sea was like a mill pond but the bar very heavy from a ground swell. A second boat was in the water to pick up thanks to the foresight of Mr Forster Supt of Convicts & was of great service. Nothing was saved but the men Officers & dogs, all Guns &c went to the bottom. After the Fairlie had been carried out I inspected her & my opinion is that she is not worth repairing there is scarce a whole plank in her. I returned to Arnolds untill nine then sat with the Major a few minutes & at 10 went to bed. Went to parade at 1/4 past nine. Between ten & eleven a sail was signalized from Pt Ross. I went to my garden from thence to the beach meeting by the way Major Anderson & some more of the Officers with the Capt of the Whaler which had left the sailor here. We all Lunched in the mess room & in the afternoon there was a race between the Whalers boat & our new boat Victoria which was won by the former as expected but the latter is a fine boat in the water and gave great satisfaction. At earliest dawn we arose. The morning was fine, the wind fair, and long before sun rise we had been to prayers for the Mauries commence and end every day by addressing the "God of the White Men" eaten our breakfast of fish and potatoes and were scudding over the waters. Under all sail the three canoes ran along side by side so close that we laughed and joked and handed our fire stick from one to the other. As the Sun rose in the heavens the wind became stronger and when off Orong Orong (219) the Maurles decided on putting in. This place is about half way to Wyderop. (Footnote) 219. Orongorongo River mouth. ... lastly ours; as we approached one of the Mauri dogs jumped over board and swam towards some rocks on which the surf was breaking with tremendous force we all thought the poor animal would be dashed to pieces but to our great delight he percieved his danger changed his course and safely landed on the sandy beach. It was now our turn we took in our sail then paddled in a little further untill just outside the break of the surf in an instant the canoe was head to sea several heavy surfs rolled in and as soon as a lull offered away we went stern first like lightening hardly had we touched the beach before we were above high water mark for the Mauries who had already landed rushed into the water and bore our canoe along like a toy untill above the influence of the waters. We were all astir at dawn some food was hastily prepared and as speedily demolished and then all was haste and excitement. Every crew ran to their respective Canoes the greatest emulation prevailing as to which should be the first to cross the surf. Tai Pari sat on a little sand hill attended by three or four old Chiefs giving directions as to the grounds to be fished on that day and observing the skill exhibited by the different Canoes. ... in holding her by the sides head to sea a race of heavy seas roll in now there is a temporary lull they run her out until the water is above their middles a roller is seen approaching they bound into the canoe and paddle as if for their lives they reach the roller just before it curls and dash over it, standing on the thwarts of the canoe, a few more strokes and they are without the curl of the breakers. Such was the scene we witnessed and most exciting it was and when any awkwardness on the part of the steersman caused a canoe to ship a breaker loud were the shouts of derision from his more skilful companions. We now returned to the Camp. In the Evg I returned to the fishing station Ed Shortland did not accompany me having gone to Katikati in the Pinace. The Canoes had returned having taken great quantities of fish which had been sent to Mounga Tapu to be cured for winter stock reserving sufficient for present consumption. (Footnote) 492. Tarakihi (Dactylopagrus macropterus). The Journal of Ensign Best, 1837-1843. Geoff Cater (2010) : Ensign Best : Journal- Norfolk Island and New Zealand , 1838-1843.